ALWAYS SHUT OFF POWER BEFORE STARTING A PROJECT SUCH AS This. if YOU ARE UNSURE "CALL A ELECTRICIAN"
110v-120v single pole-single throw time clock. Minimum 30 amp continuous load contactor with a 120v coil. A control box to house the contactor and or both the contactor and time clock. The above may not be a complete list of electrical components and electrical supplies depending on your application. Time clocks are marked for line and load. A contactor will have two connsctions with either screws or terminals for spade adaptors and are most always marked "coil".This will be where you install the control wiring from the time clock.Install the load wire from the time clock to one side of the coil and the neutral wire to the other side of the coil. Verify that is the correct voltage to your application. On the contactor the most commonly recognized way of installing your lines and loads is LINE on TOP and LOAD on Bottom. The dotted lines refer to your neutral, the solid black and red lines refer to your power source (line) and your (load) to the lights or device. 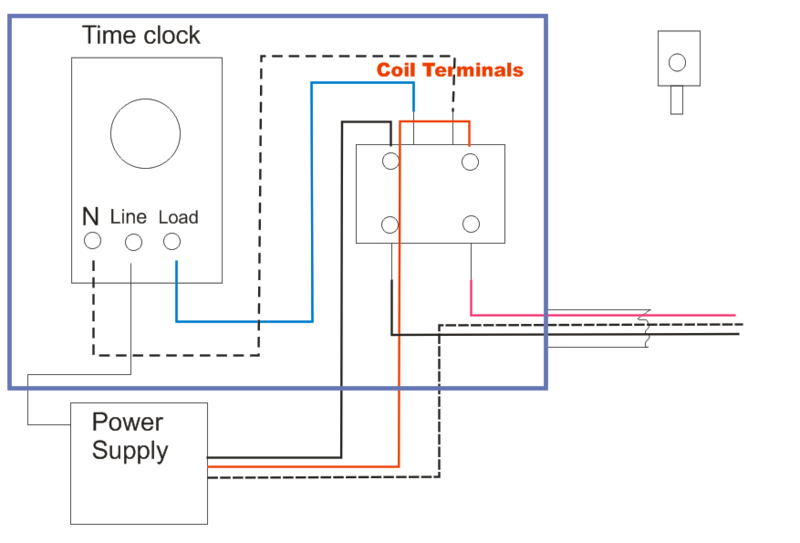 Follow the electrical wiring diagram I have shown one step at a time and it should be a simple application. Print out this page and have it with you while installing and wiring this project. Install control box if used. Be sure that you use the correct size wire for the circuit you are controlling. IE: 14 gauge for a 15 amp circuit 12 gauge for 20 amp circuit. You should have an above average mechanical ability to perform this type of work.